America’s greatest poet, according to Bob Dylan. When it comes to Motown titans, Smokey Robinson is second only to Berry Gordy Jr. Not only did he put the company on the map with his gorgeous, passionate ballads, but he also acted as producer, songwriter, talent scout and vice-president. Smokey Robinson and the Miracles scored twenty-seven pop-soul hits at Motown between 1960 and 1971, including the classics “You’ve Really Got a Hold on Me,” “Mickey’s Monkey,” “Going to a Go-Go” and “I Second That Emotion.” The Miracles could bring audiences to their feet or to tears with their satiny smooth vocals. The first act in the budding Motown label, the Miracles were pure musicians. They didn’t rely on flash; with their superior blend and songwriting, they didn’t need to. 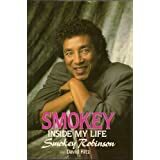 All of our books on Smokey Robinson can be found here. All our audio on Smokey Robinson can be found here. All of our video on Smokey Robinson can be found here. Spectacle : Elvis Costello with--. Season one.